Floating Breakfast: The New Travel Trend in Bali! Breakfast by the pool? OUTDATED! Floating breakfast is here, and we love it! The era of selfies and Instagram has brought many changes to the concept of luxury. Bali, for once again, has taken innovated and brought an unwanted-but-still-needed luxury to the way that you are going to eat your hotel breakfast from now and on. Gorgeous hotels and resorts in every corner of Bali bring a new groundbreaking breakfast concept in the hotel scene called “floating breakfast”. Floating breakfast wants travelers to enjoy their sumptuous meal on a tray while swimming in their private swimming pool. Well, if that is not innovative, then what is? Instagramers from all over the world visit Bali only to take that love-to-hate photo of themselves enjoying their breakfast in their pool. With so many problems in your life, a floating breakfast is the last thing that you need? You might be right but you know, honey, the floating breakfast will surely make you forget about that miserable life of yours for a while. So, let’s find four places in Bali where you can enjoy that so-wanted breakfast and take the best Instagram photos of the year. As the name suggests, your royal breakfast at The Royal Purnama, Art Suites, and Villas will make you feel like a king. The breakfast menu is not diverse, but no one can question its high quality. The basket has fresh orange juice, a selection of purnama bread (croissants, Danish pastry, white bread and muffins), and coffee and tea of your choice. You can also select between three “main” breakfast dishes like Eggs Benedict (you need to try this), mixed omelet served with sausage and bacon,m and Indonesian Fried Rice or Noodle Purnama (if you want to go full Indonesian). The floating breakfast is also served with a bottle of excellent Valdivieso Brut, but it comes with an extra cost! 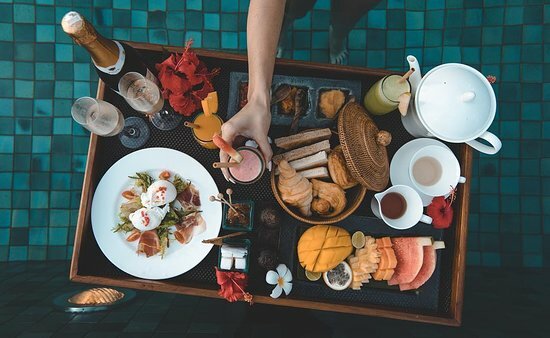 Visesa Ubud Resort’s iconic floating breakfast tray will make your Instagram followers green from jealousy. The tray is fully decorated with beautiful red, orange, and yellow flowers, and it’s completely made of bamboo, so it’s very photogenic. The best part is when you see the tray’s content. The tray includes everything that you could find at the restaurant’s buffet breakfast including waffles and pancakes, eggs, pastries, fruit, or even wine. A cup of fresh juice of your choice as well as an abundance of tropical fruits like dragon fruit, passion fruits, papaya, jackfruits, etc will add a healthier touch to your meal. The floating breakfast is complimentary when staying in the villas, so it does not come at an extra cost. The floating breakfast of The Chedi Club Tanah Gajah might not be on the spotlight, but that’s only due to the so many great features of the hotel that “overshadow” it. There is not a “floating breakfast” experience in the hotel, however, all of the rooms enjoy daily a la carte breakfast in a tray that can float. So, you can put it at your private swimming pool and enjoy it while your swimming pool cools you off. The breakfast in the Chedi Club Tanah Gajah is sumptuous and luxurious. It includes all kinds of local delicacies, which you can enjoy accompanied by a bottle of champagne. Your breakfast will be delivered to you by your personal butler, which makes the whole experience more lux and flashy. A daily a la carte breakfast is available for all hotel guests at no additional cost! Designed for the seekers of true luxury, The Kayon Jungle Resort in Bresela Village will inspire you with its conceptual architecture, and imposing three level terraced swimming pool. The heart-shaped tray designed for couples and honeymooners is truly amazing. All sorts of breakfast items can be found on the tray, from delicious egg-recipes to traditional Balinese dishes! For each stay at Nyuh Bali Villas Seminyak, you will be offered a floating breakfast complimentary. You can choose from five well-prepared breakfast sets, including tastes and recipes that match all tastes. The Balinese breakfast is great if you want to "taste" the local culture, but the American Breakfast is surely worth a try. If floating breakfast isn't your cup of tea, you can take your breakfast at the privacy of your own terrace. Torri E Merli; The Perfect Choice in Paxos Island for Gay, Gastronomy, Luxury & Wellness Travelers! Visiting the Alps with your boyfriend? Where to Stay when visiting Potato Head in Seminyak! Worldwide Hikes To Tackle In Your Lifetime! The Most Unexpected Christmas Destinations to spend your holidays in 2018! 5 Vegan-Friendly Travel Destinations for those who are kind to every kind!